I was the guest of Christian Dior Couture, which was putting on an exhibition of Dior-inspired work by contemporary Chinese artists—including quite a few of the highly-touted—as well as a selection of dresses by the great couturier and by the current heir to his atelier, John Galliano. It was neither a traditional art show nor a traditional fashion show, but it was a perfectly appropriate event to herald this venerable fashion house's interest in this re-emerging culture. Now, I am quite interested by the phenomenon that is contemporary Chinese art. Phenomenon seems like the right word because it's something that seemed to suddenly pop out of the inscrutable fog that shrouds this primal culture as mega-state to refuel the extraordinary engine that is the art market, with artists with difficult names and ephemeral histories fetching astounding prices that seemed speculative, to say the least. It would be tempting to see this emergence as a speculator's dream—suddenly a whole new batch of art stars appearing to pull down millions for those astute enough to be able to tell the Chinese apart. 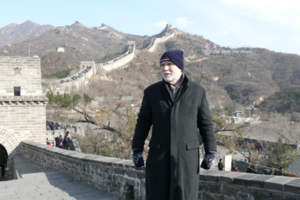 I will confess that I never had a strong desire to visit China until the last Olympics. It looked good on TV, and the sheer architectural and showbiz aspects—not to mention recent Chinese cinema—suddenly snapped the perception that this was a giant, boring, homogenous mass of static conformity. Suddenly it seemed like maybe this was the place where strange, significant things were happening. Anyway, I have been to Japan many times but this was my first visit to China, and I was eager to go tourist as well as to dip my toe into the ocean of Sino-modernism. 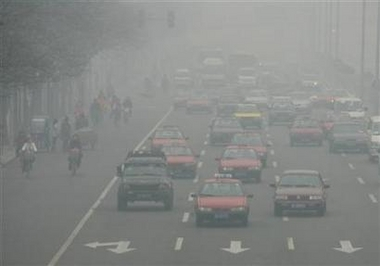 As I was driven into Beijing from the airport I was astounded by the smog. I had been somewhat prepared for pollution—my wife warned of apocalyptic pollution—but I was genuinely astounded to discover the great city under a cloud far more dense than anything I ever witnessed in Los Angeles or New York back in the coal-burning, big-car, leaded-gas sixties. It wasn't cloudy in the usual sense. The sun was out, but it cast no shadow. We drove past Tiananmen Square and the Forbidden City and these landmarks loomed out of the gray like ships creeping through the Grand Banks. 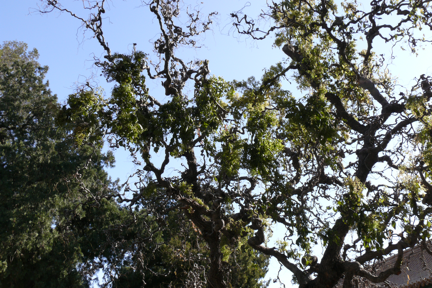 I thought of Dante, as it was a very, very hellish landscape, though it proved merely purgatorial as wind arrived the next morning to make the skies brilliantly blue for the rest of my stay. As we passed Tiananmen Square I wanted to stop and visit Mao in his crystal sarcophagus but in all that smog I was already choked up. 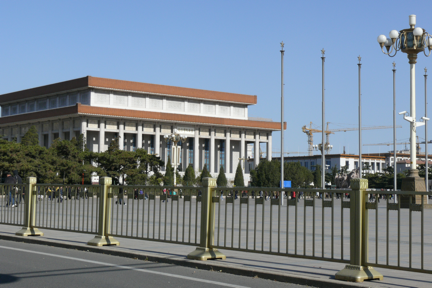 Here's Mao's final resting place; in fact I wanted to go, but our guide insisted that there was no place to park. If you ask me, Mao's Tomb should validate. Beijing is a fascinating city, reminiscent of L.A. and Mexico City in its sprawl and Tokyo in its density. It's a city of construction, with high-rise buildings going up at every turn. The cityscape is dominated by huge, yellow cranes. It's no wonder that we've had all these crane disasters with old equipment in New York: The new cranes are all in Beijing, erecting buildings that range from the sublime to the ridiculous. The avenues in Beijing are enormous—the size of expressways, but that doesn't stop pedestrians and bicycles from daring you to hit them at every intersection. I went to see the Olympic buildings and they lived up to my expectations. Herzog and de Meuron's Bird's Nest and PTW's "water cube" looked just as great in person as on TV. I would have liked to have gotten close to Bird's Nest and look for my friend Dennis Oppenheim's sculpture, but for some reason our tour guide was convinced she was in charge, so we never got within awe-inspiring distance. 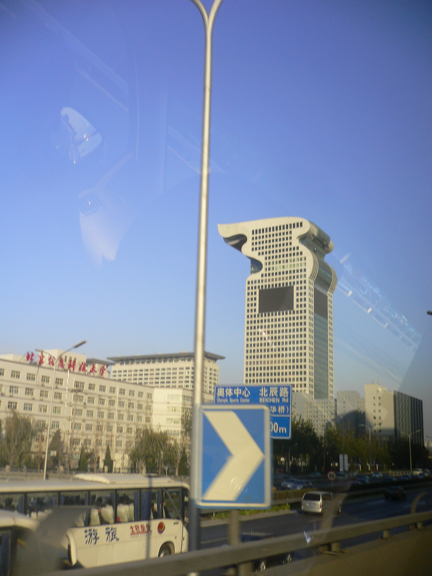 Near the "water cube" is the Morgan Plaza Hotel, which is the silliest building in Beijing. Well, technically it's what the Brits call naff. This seven-story hotel is a complex of buildings including a tower shaped like an Olympic torch with giant television screens on its sides. When I saw it it said, "Where's Godzilla when you really need him?" The new Beijing is rising at the expense of the old neighborhoods called hutongs, where the common people lived traditionally in blocks of small courtyard houses connected by alleys. The hutongs are not privately owned, so the government has been able to simply evict their residents, including families who had resided there literally for centuries, and raze blocks to make way for architecture which seems to have awakened after a six-hundred-year sleep. 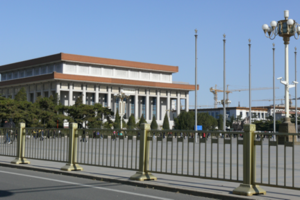 The Olympics was the occasion for the transformation of Beijing into a showcase, and basically the city's significant points of interest were built in the fifteenth and twenty-first centuries. It may be that contemporary Chinese of the sort they have planned won't want to live like their ancestors, but I think they may eventually discover that tearing down the hutongs was a mistake. I'm sure American tourists and retirees would pay to live like coolies and ride in rickshaws. My favorite ancient building is the Temple of Heaven where the Emperor used to go to sacrifice. From what I gathered, these solemn, dignified, all-male occasions were elaborate, ritualistic barbecues in which a nice meal was prepared for the immortals and then shared by the mortals. The temple itself is a six-hundred-year-old round structure, the form of which is elaborately symbolic. It is located in a park that is literally mobbed with old people, most of whom seemed involved in peculiar hobbies—Peking opera karaoke, card playing, mah jong, bean-bag kicking, weird racket games, and playing traditional musical instruments. Many of those performing spontaneously don't seem particularly interested in whether or not they have an audience, such as this couple here. 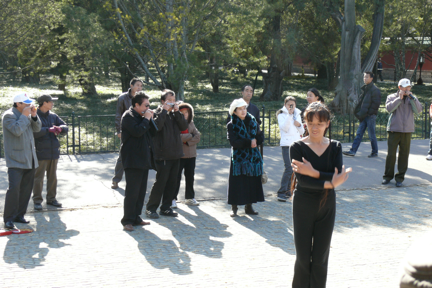 But others seemed to delight the retiree-aged crowd, like this Irish step dancer who was accompanied by a Beijing version of the Harmonicats. The current attraction of architectural significance in Beijing is the CCTV Tower, which I visited on my last day in town. 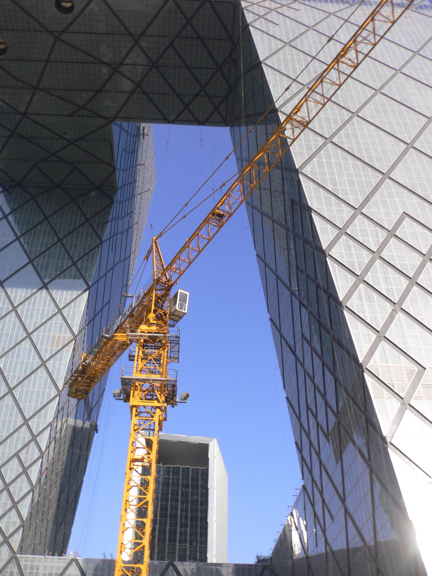 This Rem Koolhaas-designed feat of engineering is the future headquarters of Chinese national television. The contortionist building that is now estimated to cost over five billion dollars was apparently executed from a sketch that Rem doodled in a few seconds. It has no right angles and defies skyscraper logic by toying with gravity and tension. Any building can be a high-rise straight up—this is a high-rise sideways. One of my companions thought the building a monument to hubris. I wouldn't go that far, but we agreed that it was built this way primarily because they could. What's an architect without hubris? A decorator. I dig the building. It's totally Delirious Beijing. In the "bridge" part of the building there is a sky lobby that connects the production side with the cultural-center hotel side. Looking up at it you could see what look like three giant hatches. This is where the glass floors will eventually go, enabling visitors to look straight down past their shoes to the plaza a few hundred meters below. But in its incomplete state I sort of imagined these hatches as a feature of Dr. Evil's corporate boardroom, the trapdoor port: "When Mr. Bigglesworth gets upset people DIE!" Fortunately we didn't have to walk through the sky lobby, but we did walk through the theater, which has beautiful finishes—as did all the interior spaces we saw. And in this Koohaas theater there's no Prada store! Anyway, I love the building. I wish we could have one in New York. I wasn't supposed to take any pictures of the building, but my finger slipped. I'm not really claustrophobic but I had some kind of reaction building on the drive to the Great Wall. You take the Badaling expressway. Our tour guide, whom I began to suspect of getting kickbacks everywhere we went, dragged us into the Great Wall coffee shop, which of course also had the Great Wall giftshop and the Great Wall authentic antique shop, where everything looked somewhat too flawlessly old and patinaed. Our guide said the antiques were authentic. 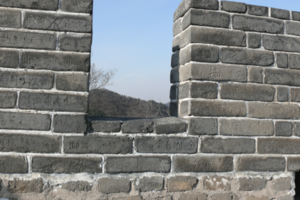 She also said that the Great Wall was visible from space, which is not really true, and everyone I was with also believed this to be true. Instead of arguing I simply replied that the Long Island Expressway is also visible from space. Here I am, not visible from space, in my Anderson & Sheppard overcoat and two-dollar Great Wall hat and gloves. 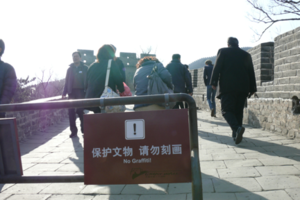 Although the Great Wall is about 4,000 miles long, not that much of it is open for business, so to walk the Wall you have to visit one of the official sites. 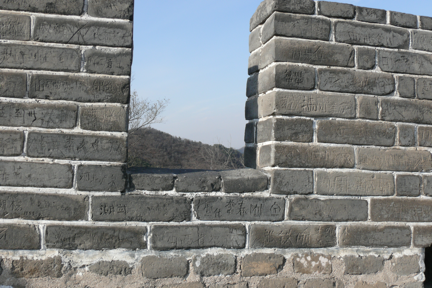 The one I visited was in, yes, Badaling, where Chairman Mao famously walked on the wall. Our guide pointed out a tower that Mao had walked to and said that if you climbed to that spot you were a hero. I wasn't feeling heroic. The wall runs across the mountains and basically that trek would have equaled about an hour of stair climbing, so I hung out with the cigarette smoker in our group and took in the sun, which felt good in the wind sweeping down from Mongolia. The wall here is covered with graffiti, every inch, scratched into the brick. I guess this is the oldest form of the scratchiti all over New York. I wanted to leave a tag—SAMO©, in memory of my friend Jean-Michel— but I didn't want to get collared in China. The Wall was, of course, built to keep out something else sweeping down from Mongolia: the hordes of Genghis Khan and other like-minded barbarians. As we drove back for an hour through the continuous city and its countless undistinguished tall buildings, a tedious cityscape if ever there was one, all I could think was "the Wall didn't work." There are far too many people on this side of the Wall. Maybe it wasn't keeping the Mongolians out. It was keeping the Chinese in. 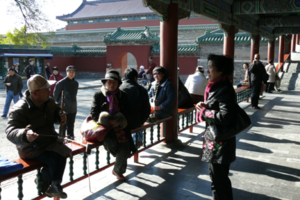 I had a similar feeling visiting the Forbidden City, the 999 room imperial palace, so called because only aristocrats could visit the compound. The place was jammed, mostly with Chinese in casual attire—mostly tourist groups that could be identified by their matching color baseball caps and the pennants carried by the tour guides. "It's not forbidden enough," I complained, whenever anyone would listen. I kept thinking that now that China has gone capitalist in a big way, maybe it's time to bring back the Emperor. I decided that when I got back to New York I would watch Bertolucci's The Last Emperor again and give some thought to how a restoration might work. I loved the Forbidden City. I felt strangely at home there. I liked the whole aesthetic, and especially the family quarters and the names of the rooms. The contemplative areas, with their decorative trees and extremely artificial improvement upon nature showed that these people had gardeners and interior decorators who have never been surpassed. Mental note: "send Ricky Clifton to Forbidden City." 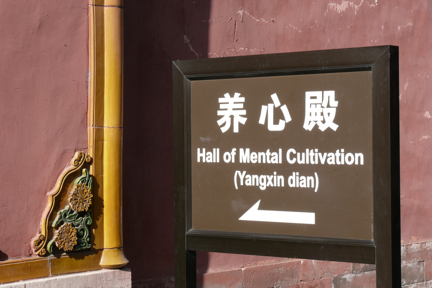 Anyway, my house in Connecticut now has a "Hall of Mental Cultivation." There's no TV in it. Yes, I had a fun weekend in China, and I came back with lots of ideas that will continue to percolate in my mind on subjects ranging from contemporary art, to feng shui, to food. I'm thinking about Peking duck for Thanksgiving, with pumpkin in orange sauce and soup dumplings. I feel a little like Marco Polo now. And I'm sure it won't be long before the next weekend in China. I'm thinking Singapore. I want to try that turn-down service they have on Singapore Airlines.